Hello, internet. Glad you could make it. Please, join me. There’s hot cocoa and those pre-cut sugar cookies freshly baked and sitting on the table. You don’t want the cookies? Trying to cut down, huh? Oh, you don’t like the fact that Rudolph is on them. Funny thing is…that’s sort of what I wanted to talk about. Maybe you haven’t heard of me before and you came out of curiosity. Well, let’s get the disclosure business out of the way first. Rudolph The Red-Nosed Reindeer is one of my favorite Christmas specials. There have been other attempts to tell the story, each loosely based in some way on a classic book designed to bring customers to a particular store. I discussed all that before, last year in fact when I did a Video Review of the special. Even before then I talked about this special and the song that inspired most of them, also based on the book mentioned earlier. It’s a timeless holiday classic about a reindeer with a special power nobody saw until it was actually needed. Until then they misunderstood God’s intention for the poor guy to help Santa. (If you’re not a Christian…you’re missing half of Christmas but that’s not important right now…but you can ascribe whatever origin you want on Rudolph’s shiny nose.) They realized their mistake when they saw he was actually the savior of Christmas. (Is that irony? Darn you Alanis Morissette, you get coal!) Jeers turned to cheers and Rudolph went down in history. Of course there are those who hate history. They refuse to see the special as anything more than another target on old shows, try to add modern adult points of view to a 1964 show running under kid logic and the prevailing wold view of the time. Rather than seeing what it was they condemn it for not living up to modern points of view, or at least one particular point of view, but I won’t go that far if I don’t have to. Frankly where I have to go is disappointing enough. Apparently the Rankin/Bass classic is the latest target of scorn, and it shouldn’t surprise anyone who has been here long enough that I come to protect it. Internet…let’s talk reindeer. The video above is a brief list of the complaints made against the special. Charges of homophobia make absolutely no sense to me. This isn’t an allegory for that. Even the X-Men didn’t get into that for years. Like the X-Men (I wonder if Rudolph’s a mutant in the Marvel universe and if Bendis’ Scarlet Witch took his powers away as well…because Brian Michael Bendis), Rudolph was ostracized for having what they all thought was a physical deformity. Hermey was criticized for not conforming to elf social norms and wanting to live his dream of becoming a dentist. Trying to connect their story arcs to anything else is overreaching and reading what you want into it whether it’s there or not. The “man’s work” scene the Huffington Post got in a huff about (pun intended) was a product of the time. And you’ll also note (which they didn’t) that Mrs. Donner and Clarice said the heck with it and went after Rudolph anyway. So it hardly points to a defense of that outdated thinking either. Then again, in nature the male often protects the female and the young so I guess animals are sexist too. Typical man. Then we have the continuing complaint about Rudolph not calling the other reindeer out on their former mistreatment. I’ve discussed this before but now it’s gotten worse. Where once they demanded an apology for Rudolph from the reindeer (which the special does have, off-screen via narration granted) now it seems someone thinks the special is PROMOTING bullying! Go back to my review and I called Santa out for his actions as well as the others but I don’t think this is about promoting bullying simply because it’s on-screen. The Bible has bad things happening in it, but how else do you condemn sin if you don’t say what it is? Rudolph is shown to have a special power that nobody can see until it becomes useful. It not that the reindeer only bag on him until he’s “useful”, it’s that they couldn’t see how special he was until his red-nose light became useful. Folks, I’m an actual bully victim from high school. Forget that the internet usually misuses the word “bullying” to protect their own scummy postings and actions, you don’t know what actual bullying is until you have experienced the real thing. I have. I know what it’s like to be picked on like Rudolph was but more for reasons Hermey was looked down on, because I had a high imagination nobody understood, plus being very socially awkward and the things that interest me in a time when “geek” was still a bad thing. (And even then it’s treated as some kind of freakish behavior by those on the “outside” of geek perspectives.) 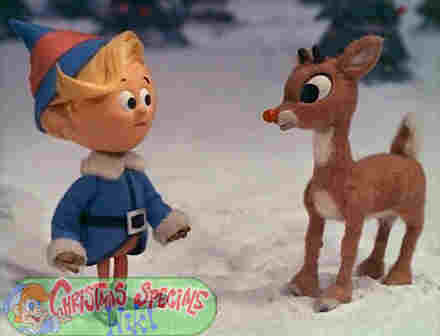 I have never once seen this special and thought the special did anything except condemn those actions by everyone who berated Rudolph and Hermey. I also don’t insist they apologize or be called out for realizing what Rudolph can do nor do I see realizing that as self-serving on Santa and the others’ part. I wonder if the girl who received her actually was named Sue? I would say that it’s more relevant now than ever, because there is so much going on. But I mean, it’s all reconciled in Rudolph, and surely people wouldn’t love it so much if it left a resonance of bullying. It wouldn’t be so indelible in people’s hearts. I’ve got to tell you, having been in it and having a list of credits over the last 60 years, people read my credits and say, ‘Oh, you were in Rudolph.’ And they start to cry. Now, I don’t think they are associating Rudolph The Red-Nosed Reindeer and bullying. Plus the special, the song, the book, and any other proper telling, involves Rudolph forgiving them, or at least not telling them off for the deeds they’re repenting from. That’s very much in keeping with the spirit of Christmas. I know we’d rather hate and destroy others rather than forgive and understand in our increasingly rage-fueled society but that’s not in keeping with the season’s message. Speaking of Cinema Blend however, writer Mick Joest decided to create what I hope was a gag (but after that video about Syndrome being the “true hero” of The Incredibles who really knows?) about seven “disturbing truths” of Rudolph. Look, I’m not saying that trying to explain away kid logic or budget limitations can’t be funny. However, blaming an inability to design more than a few elves in time for the special on “inbreeding” was just kind of dumb, trying to call Hermey a sadist because he wants to know where he got “realistic teeth” and jumping to conclusions about pulling out animals’ teeth besides the Bumble is just stretching, and calling Yukon mentally challenged for hunting snow in the North Pole was just mean. As far as the speed of Rudolph and Clarice’s romance, is that anything new in stories? Where are all the people calling out Romeo and Juliet for their actions? And yes, Dr. Werthams of the world, I CAN relate the Shakespeare play to a kids Christmas special because it’s all storytelling to me. I have seen real-world romances lead to the altar quickly and still work. My parents did, and my cousin got married quick to her husband and they’re still married. Plus again, animals find mates quicker than humans. I kind of see his point about Rudolph’s family missing his growing up as well as Rudolph growing up while on the run from the Abominable Snow Monster. Of course if the father had stood up for his son and Santa hadn’t been so grumpy that day things would have been different. Look, internet, I know payback and cynicism is the way you like to do things nowadays. It may be why you consider an action movie with a body count to be a Christmas movie. However, trying to shove it into a story about understanding and forgiveness, two things I know you avoid like you owe it money, is just unnecessary and sad. If you can’t relax and enjoy the fun family friendly adventures of a reindeer and elf seeking acceptance of their unique talents and goals that’s on you. Just stop trying to ruin it for the rest of us, please? I don’t ruin your shows (outside of calling you out on your demand for alleged realism versus…actual realism) so stop going after mine. You will never convince me or others like me that this is a bad special. Just the opposite in fact. We see the good and embrace the fun. That’s Christmas, folks. Posted by ShadowWing Tronix on December 4, 2018 in Animation Spotlight, Christmas Spotlight, Television Spotlight and tagged Christmas specials, Christmas Spotlight, commentary, Rudolph the Red-Nosed Reindeer (TV special). I like how you wrote your opening paragraph, Tronix. It truly grabs the reader’s attention and gets readers to examine more of the article. You did make some very thought provoking points throughout. Rudolph the Red Nosed Reindeer is a classic that I enjoy watching every year. I always come away with a very positive, hopeful feeling after watching this show. A new holiday classic now is the 2 hour long Jersey Shore Thanksgiving Special. I watched that the weekend before Thanksgiving, and that program also gave me a good feeling about the importance of friendship and family. Last night, I watched the Christmas Lost and Found movie on Lifetime channel. That also was a nice movie that leaves one with a positive mood about life. Plus, there was the extra bonus of the lead actress Tiya Sicar, who is quite a hottie! She also portrays a voice of one of the characters of a recent Star Wars cartoon series.